computers-and-nothing-else: What is a Sector and a Bad Sector ? A sector is a small area on the surface of a hard drive or a floppy disk. The smallest unit that can be accessed on a disk. When a disk undergoes a low-level format, it is divided into tracks and sectors. 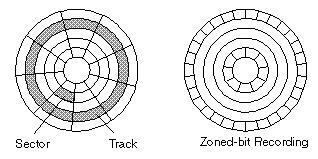 The tracks are concentric circles around the disk and the sectors are segments within each circle. For example, a formatted disk might have 40 tracks, with each track divided into 10 sectors. The operating system and disk drive keep tabs on where information is stored on the disk by noting its track and sector number. Modern hard disk drives use a technique called zoned-bit recording in which tracks on the outside of the disk contain more sectors than those on the inside. A sector that cannot be used due to a physical flaw on the disk is called a bad sector. Hard drives are contain millions of sectors. It is very normal for some of these sectors to be bad sectors, even when the drive is first manufactured. In addition, a small number of sectors will normally go bad during the lifespan of a drive. When this happens, the data in those sectors may be lost, but the data on the rest of the disk will be unaffected and the disk is still completely usable. A bad sector cannot be repaired, but it can be marked as unusable. Once marked as unusable, the Operating System will know not to attempt to store data in that bad sector. The storage capacity of the disk will be decreased by the amount of storage space in the bad sector. If your hard drive develops a bad sector, back the hard drive up immediately. If the bad sector was caused by a faulty drive head, the problem can quickly spread to other sectors on the disk.